We used to catch butterflies, beetles and whitetail rabbits when I was a little kid, in Brooklyn, back then. We lived in the East Flatbush neighborhood, right at the edge where development had stopped for a while, taking a breather, and that’s why a modest area was still undeveloped. That’s how Murder Incorporated was still able to dump bodies in burned out cars near my house, why we could find Black widow spiders, chase darner (AKA dragonflies), marvel at why the reputed oldest house within 300 miles remained a boarded up dump (it’s recently been saved and opened to the public), and we could go to see the Dodgers, all in the same day. Our row house was probably built in 1940. As a little kid, I remember that the very modest, much older houses down at the corner (Beverly Road), used to have goats. Goats! This puzzled the heck out of me. What was it like before they built the thousands of houses in my neighborhood? What more was there than just goats? We used to watch and follow butterflies. 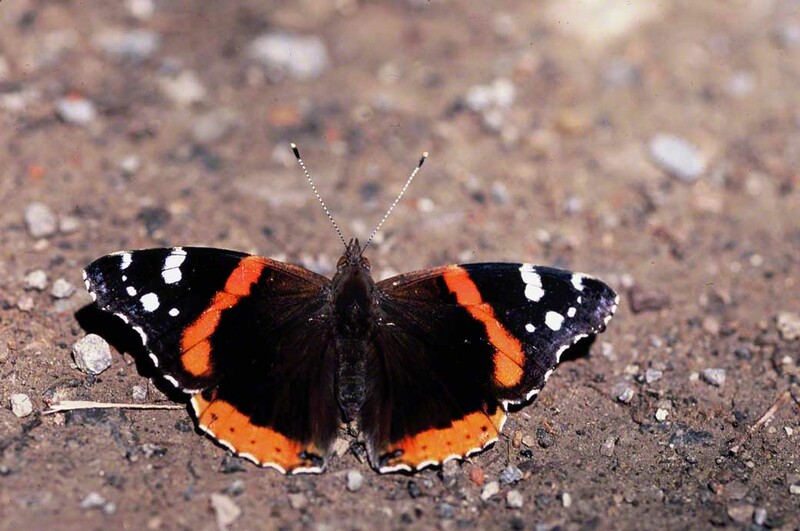 We ogled over Red Admirals like this one. We had no nets, no binoculars, no field guides and no one to direct our curiosity. Pity that. If only our school, P.S. 244 had offered us the renaissance education that we little kids were ready to soak up. Right up to the early 1890’s, hundreds of small market farms in Brooklyn fed the people of Manhattan. In this landscape, Brooklynites hunted butterflies and moths, and out of it arose the New York and Brooklyn Entomological Societies. Naturalists like George Hulst could collect moths, as late as the 1870’s, along Flatbush‘s wooded paths, and in the area’s glens and hidden recesses. By 1905, all the market farms were gone, not because they were unproductive but because their owners had sold them off to real estate developers. Wow! again. Cattle, horses, pigs, chickens, geese and plowed fields in Brooklyn. Regal fritillaries? Rare blues? Diana fritillaries where Jackie Robinson ran the bases where Ebbets Field used to be? I expect that many of you can commiserate with us here. Progress, development, extended electrical lines, paved asphalt. The little boy in me wishes sometimes that ….